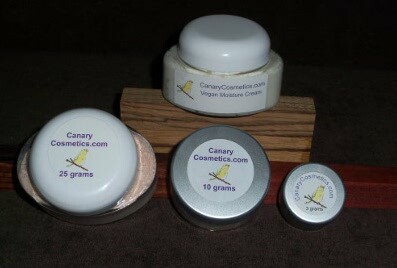 Canary Cosmetics has developed exclusive formulas for mineral makeup, lip balms, and moisturizers. We use the purest and simplest ingredients and blend them in small batches. Our formulas are only available from us under the Canary Cosmetics name. We believe in using ingredients that won't hurt the environment or health. We do not do any testing on animals. We believe simple is best whether it is pure mineral makeup or the way we run our business. What's the significance of the Canary, and purple and yellow? The purple symbolizes wisdom and power, and the yellow represents the canary that chemically injured persons symbolize. Just like the warning that the canary in the coal mine gave to miners, the chemically injured are warning everyone of the dangers chemicals pose to our society. Join us in making the suffering of these chemically injured folks heard in a world that is rapidly being destroyed by the overuse and abuse of toxic chemicals. Canary Cosmetics Vegan Moisturizer Sale! "I just wanted to take a moment and thank you for offering such a great product. I'm always eager to try new products so when I heard about your business a few months ago, I had to try it. Without even looking for ways to clear up my skin, my skin cleared up immediately when I started using your foundation. Ever since I've used your products, I've never broken out. I can't believe that all those years it was my foundation that was causing problems with my skin. Wow. I'm speechless. I wasn't even looking for a product to even out my skin tone or clear up my skin, yet your makeup did both. I'm completely amazed at how good my skin looks. Thank you for offering such great products at such an affordable price. I don't dare use any other makeup but yours now. Thank you so much!!" "I love your products! I was one step away from purchasing a popular mineral makeup advertised on TV all the time. ... I'm so glad I wasn't lured into paying the high prices of the infomercial products. I think it's great that you offer sampler packages; it gives skeptics like me an affordable opportunity to try out a new product. I was so happy with the smoothness of your foundation. I get the coverage I need without the orange tint, oiliness, and lines that I was used to with liquid foundations. I'm a Canary Cosmetics customer for life now! Thanks for offering such a great product!" "Love love love Canary Cosmetics and will NEVER use anything else! I've been using them for over a year now and my skin has never been in better condition. Thank you so much for taking such good care of your customers." "WOW!!! This mineral foundation is by far the best I have ever used!! I have been using [Brand A] and [Brand B] for five years and this is way better!! I am switching over to Canary!! Thanks so much for this product. It goes on like satin!! I loove it! Minimizes my pores too!!! Great stuff." "After years of suffering allergic reactions to every beauty product known to man, I found Canary Cosmetics and have been a faithful follower. Thank you for making my life and face brighter."